In 2018 museums and galleries across the UK celebrated the history and art of women in their collections. Many of these events and exhibitions were designed to tie in with the Suffrage Centenary, commemorating 100 years since (some!) British women first gained the vote. There’s a lot to take away from these amazing projects, many of which I learnt about through Women and Power, a conference held in Oxford last month. The conference was co-curated by the University of Oxford’s National Trust Partnership, and brought together people from over 100 different heritage and academic institutions. Its jumping-off point was the National Trust’s year-long scheme which aimed to draw out the stories of women in their properties throughout the country, stories which were – in the words of their Head of Public Programmes, Annie Reilly – “locally relevant but nationally resonant”. These are four key lessons which emerged through the course of the two-day event, and why it’s crucial we should carry them forward in the way we understand and uncover the historical role of women in our museums and galleries. As many museums and galleries decided to investigate the history of women in their collections, they found a real wealth of stories deserving of wider research and attention. Suffrage was for many a helpful starting point; one of the most striking examples was at Killerton, an estate in Devon owned by the National Trust. Here the researchers uncovered an intriguing story in the history of the house, owned by the Acland family, which allowed them to capture the mood of the nation back in the early twentieth century. Though Eleanor Acland (pictured right) was a leading suffrage campaigner, her aunt Gertrude was totally against the movement, serving as the Chair of the local Anti-Suffrage league; she even held an anti-suffrage garden party at Killerton in 1910. As Dr Sophie Duncan (the academic lead for the National Trust on Women and Power) says, you find yourself wondering what exactly this involved. Killerton used this story as an opportunity to paint both sides of the argument as it stood at the time, threading both their narratives through the property. This idea also wonderfully demonstrates the aptitude for including many different voices from the past, even if they’re challenging for a modern audience; not all our ancestors, after all, were on the “right side” of history. Featuring voices like Gertrude’s helps to throw out the notion that history is static, and progress is a given, and in doing so it highlights even more the incredible achievements of women like Eleanor. Killerton’s team found an excellent method of bringing words to life, something which has been a challenge for many institutions trying to exhibit this difficult and tumultuous period of history. The National Archives, for instance, has a huge number of documents relating to women’s suffrage in its collection, but they are – in the words of Vicky Iglikowski-Broad, one of their Principal Records Specialists – a rather unfortunate “archival beige”. Their method of overcoming this barrier was to create an immersive experience where visitors played the role of a suffragette, with a recreated Women’s Social and Political Union headquarters and replicated materials from the era. This approach is much like of one of the projects which really took me by surprise: The Hard Way, a performance piece co-written and performed by the folk singer Louise Jordan (pictured left). 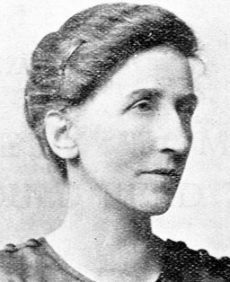 It uses the words of the mostly unknown Hannah Mitchell (pictured below) to explore her life in the suffrage movement as a working-class northern woman. As part of the project Jordan also developed a beer, which became key, she says, in engaging men with her work; in her experience, “the silly things can be so useful”. Both of these projects demonstrate a novel and inspired approach to bringing the truth of the suffrage movement to new audiences. The conversation however isn’t – and shouldn’t be – limited to suffrage. Cragside, the Victorian home of Lord and Lady Armstrong in Northumberland, explored the role of women in Lord Armstrong’s factories (as shown in the feature image above). Shibden Hall took the opportunity to celebrate Anne Lister, a prolific diarist and traveller whose writing candidly reveals her lesbian identity. (We were all quite excited for the BBC dramatisation of her life featuring Suranne Jones, Gentleman Jack, airing later this year.) The story of Ellen Turner, a 15-year-old abducted from school and forced into marriage in 1826, was the subject of a major audio installation at Lyme in Cheshire, near to where she was born. Despite hitting the headlines at the time, her story was largely unfamiliar even to the staff at the gallery; and she left no documents behind when she died four years later, aged just nineteen, in childbirth. The team at Lyme diligently worked to tease her words, her story and her defiance from the court transcript known as the ‘Shrigley abduction’. Using a wider range of senses can be an interesting way of evoking a fuller connection with history. The designer Frith Kerr worked with the perfumer Lyn Harris to create a scent to accompany one of the paintings at 2 Willow Road, the house owned by the enthusiastic art collectors Ernö and Ursula Goldfinger. A painting of an industrial landscape by Prunella Clough was matched with a unique smoky scent; it was later transformed into a perfume, worn by stewards in the property. This murky smell, Kerr thinks, would also have echoed the cigarettes Ernö was so fond of, flowing through the space in the same way his heady trail once would have done. Several institutions, however, had the regrettable (if understandable) problem of an absence of women in their collections. This was most evocatively explored by part of the second project run at Cragside, Switched On!, in which postgraduate students at Newcastle University created various installations for the property. 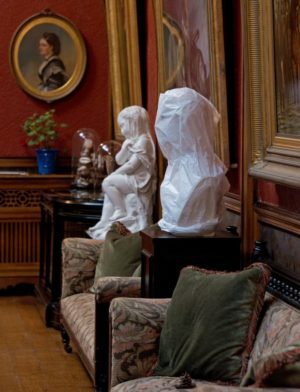 As part of The Great Cragside Cover-Up, images of men throughout the property were carefully covered (as shown right), drawing powerful attention to their ubiquity as well as the nature of the pieces which remained, many of which were nudes. In a similar vein, Dulwich Picture Gallery in South London were aware that they only have one female artist in their collection. They instead worked to bring together two isolated groups from the local area, older women and young girls who were either refugees or migrants, and consider the how the images of women found at the gallery related to their sense of identity now. The most powerful story for me, though, was the work of Gemma Ashby and her team in Women of Tyneside. Although working-class women were a key element of the suffrage movement, and held key roles within Tyneside’s industry throughout the twentieth century, they struggled to find any material relating to women in the collections of Tyne & Wear Archives and Museums. 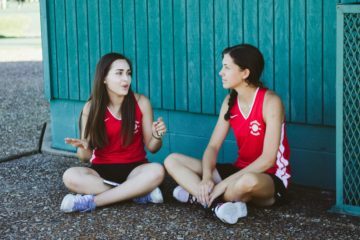 Taking a slightly broader range of items out to local women for them to discuss, they forged relationships with these groups which led to the creation of new oral histories on taboo subjects such as menstruation, contraception and domestic abuse. This, as Ashby said, all came from “women who told us they had nothing to contribute”. All of these demonstrate brilliantly what role women’s history and women’s art can – and should – play in museums and galleries today, a role which remains often sadly and frustratingly lacking. Considering this in the light of the depth and inventiveness of these projects, there really is no excuse. When it comes to sharing and promoting hidden histories the internet is an incredibly powerful tool, breaking the silence around accepted narratives and making broadly available a more accurate account of events. Even in the digital space, though, this requires active work on the part of dedicated individuals. 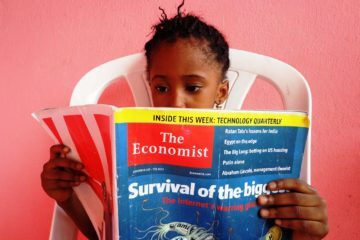 As it stands, around 18% of biographies on Wikipedia are of women, with ‘edit-a-thons’ now running worldwide to try and improve this; this is still a little better than the 8% of traditional encyclopaedias. The Oxford Dictionary of National Biography is sitting in the middle of this range at around 11.2%, but given that they are a tiny team working from an originally-Victorian source even this small figure is arguably a noteworthy achievement. Carving out a niche in the digital space for women was one of the key aims of the Royal Collection last year, which deliberately catalogued the work of female photographers in their collection in an attempt to disrupt the idea that men have always been the champions of the discipline. This is in part due to the old adage about history being written by the winners; many female photographers have been almost wholly lost to time, and the exceptions often stand when, for example, they’ve written their own biographies. The work of some of these women is still available on their website, including Dorothy Wilding’s striking portrait of the newly-crowned Queen Elizabeth II. The project has been a phenomenal success, and according to Assistant Curator Catlin Langford researchers are now contacting them specifically about female photographers in their collection. This Vexed Question at the Royal College of Physicians explored the stories of pioneering and forgotten medical women, drawing out debates about historical women in science and comparing them to coverage on the topic in the modern day. Although the exhibition has long since been dismantled, you can still explore it through the video freely available on YouTube, wonderfully hosted by co-curators Dr Kristin Hussey and Briony Hudson. The internet can, through projects like these, serve to spread the word about ‘lost women’ and their lives, while also promoting the work of contemporary female artists. Many galleries have recently seized the opportunity recently to do as much, including Richard Saltoun, the Royal Cornwall Museum and the Natural History Museum, London. I hope to see this trend continue, with many more institutions working to subvert the norm of the male artist, the male collector and the male subject through their websites, if not in their physical museums. I’d love for the idea of promoting women’s history to be a given, but controversy was a backbone of all of these projects. As part of her speech, Director General of the National Trust Hilary McGrady asked “in appealing to one audience, do we really need to alienate another?”, and the answer – however unfortunately – currently seems to be ‘yes’. Some of the responses these projects attracted were nothing short of vitriolic. People spoke of being harassed off social media, of their staff being hassled in person by attendees, by members of the public who were furious they were being forcibly exposed to women’s history, even something as basic as the suffrage movement. Much of this was carried out by men, but not all of it. To avoid continuing this spiteful behaviour I will not name individuals who’ve been targeted before, but the press scandal around The Great Cragside Cover-Up was widespread (see the Daily Mail’s “fury”, pictured right), despite the fact many journalists who reported on the story could not have possibly seen it; by the time the story broke, the exhibition was already closed. Dr Duncan mentioned that she once joked to her colleague Rachael Lennon that her job had become ‘Director of Spoiling Things for People’. Museums, galleries, heritage spaces, areas like the National Trust are often considered to be apolitical, to be an opportunity for escape; but of course all of them are inherently entrenched in politics. The absence or mistreatment of women has been part of the history of all of these places, and that’s all while avoiding the sticky, uncomfortable question of where all the money for them came from. Misogyny sits alongside slavery, classism, exploitation and colonialism as an unavoidable element of our history and our culture, woven into the very fabric of these spaces. It isn’t just that including women artists and women’s history should be considered as nothing more than accurate; avoiding these conversations is tantamount to cowardice. That’s not to say that staff should be made to bear the brunt of individuals’ prejudices. Museums and galleries, when hosting exhibitions like these in future, should pay careful attention to supporting the mental health of their employees, and to avoid the idea that they should just become ‘thick-skinned’ and endure. Many members of museum staff both behind the scenes and in front of house have already shown extraordinary bravery and resilience through these projects, but it’s vital that this doesn’t become part of their job description. Not all of the response was negative; the online polling for the National Archives’ project came out positively, and 72% of the visitor feedback for Women and Power at the National Trust was positive or neutral. This isn’t exactly a dizzying statistic, but given the viciousness which circulated online as well as in the press, it is encouraging. My favourite story came from Louise Johnson, who mentioned a man that had come up to her after one of her performances; he said something along the lines of “my wife dragged me along and I thought it’d be rubbish, but I actually quite enjoyed it”. There is some hope moving forward, it seems. When dismantling This Vexed Question, Dr Hussey said she found herself thinking “how could we go back now that we’ve come forward?” It’s equally frustrating and heart-breaking to think how much of this material has been carefully pulled out of the archives and knitted together into a coherent, compelling and sometimes ground-breaking story, only to be taken down and put back on a shelf again. There is hope for the legacy of these projects, especially in the form of digitised exhibitions, and a fierce desire for more from people behind-the-scenes; but given the unfortunate outrage these exhibitions seem to create, it’s crucial to keep a careful eye on how this now develops. Money is, of course, a huge part of the conversation. This is not a well-funded sector, and institutions are beginning to question the ethics of some of their private donors, as we’ve seen recently in the case of the Sackler family. It isn’t fair to expect the public to pick up the bill, especially given how much ticket prices (and transport fares) can make museums and galleries exclusive and elitist spaces. I was pleased to learn that the National Trust does have a few methods of helping people access discounted tickets, but these are understandably limited. This leaves institutions in the unfortunate position of often having to ask people to work for free. While staff are nothing but grateful to have you on hand as a volunteer, it’s questionable how sustainable – and indeed ethical – it is to continue to rely on this. It became a particular issue for Rebecca Odell, Museum Manager at Hackney Museum, when she was developing their exhibition Making Her Mark. In an area where the majority of the local community is of Afro-Caribbean descent but no one from that background worked in their team, it was especially difficult to go out and ask for free collaborative installations in the gallery. Odell and her team managed this admirably by using it as an opportunity to promote the charity founded by one of their collaborators, Sistah Space, which works with women and girls in the community affected by domestic and sexual abuse. This is one excellent example of how institutions can make the best of a difficult situation during a period of financial hardship for the sector. The broader background of endemic racism also needs to become a key element of the discussion moving forwards, and not just in contextualising properly some of the more problematic pieces in museums’ collections. It’s arguable that the key factor in broadening the scope and authenticity of these kinds of exhibitions is in shifting who’s running behind the scenes. It doesn’t come as much of a surprise that a 2016 report by Arts Council England found that only 17% of the arts and museum workforce come from black and ethnic minority backgrounds, but it is undoubtedly something that needs to change. I was incredibly pleased to learn about the Museum Detox network, which is actively working to improve this, but there are considerable obstacles in place for people of colour in the heritage industry which their white colleagues don’t have to consider. Sara Wajid, the founder of Museum Detox, spoke candidly about how positions at smaller, rural institutions – a vital step in the ladder for many heritage careers – just aren’t possible for women of colour, given how they necessitate moving into mostly- or all-white neighbourhoods which are at best isolating and at worst dangerous. I don’t wish to undermine any of the amazing work done by museums and galleries in the past few years to work against systemic biases in their collections, and the mood in the room at Women and Power was very much one of steely determination that these projects should continue, develop and improve. The question is how realistic (and how safe, especially for female staff) it is to push forward these ideas in institutions which might already regrettably be set up to squash them out. In her evaluation of Women and Power, Dr Jenna Ashton suggested that it’s possible that the National Trust may need to undergo radical change to act properly on the aspects raised by these programmes, but that they are uniquely well-placed to combat misogyny, racism, homophobia and all forms of prejudice. Their Challenging Histories programme has certainly been a step in the right direction, and I’m very much looking forward to seeing how the Director General and her team move forward in balancing their “places of pilgrimage” (her words) with the need to bring vibrancy, relevancy, and above all uncomfortable historical accuracies to their properties. After all, that is the aim of all these projects, as so beautifully summarised by the National Trust’s Head of Public Programmes, Annie Reilly, whose insightful words we also started with; that it makes their stories “more honest, more relevant, more powerful, more evocative and just more interesting”. Feature image via Flickr. 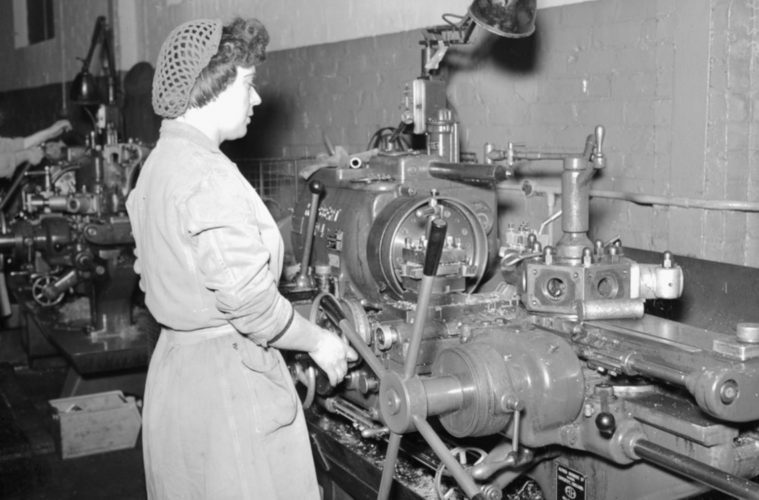 It’s a black and white photograph of a woman working on a large piece of machinery; this is Lord Armstrong’s factory at Elswick. First inset image via Killerton’s Facebook page. 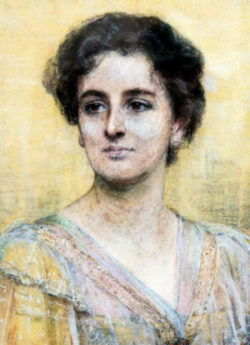 It is a portrait of a pale woman on a yellow background; this is Eleanor Acland. Second insert image via Flickr. 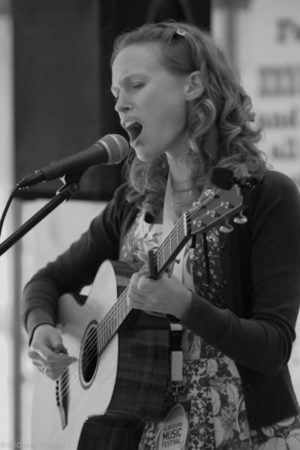 It is a black and white photograph of a woman playing a guitar, her mouth open; this is Louise Johnson. Third inset image via Twitter. It shows a white marble bust covered up in between two sofas, with a red wall and portraits hung behind. Fourth inset is this YouTube video of the RCP exhibition tour. 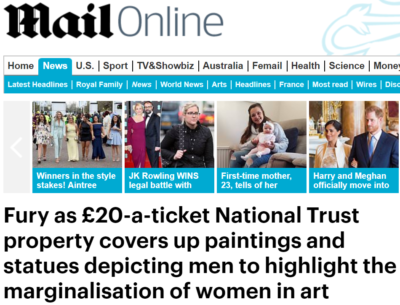 Fifth insert is a screenshot of the Mail Online, with a headline reading “Fury as £20-a-ticket National Trust property covers up paintings and statues depicting men to highlight the marginalisation of women in art”. Sixth insert via Wikimedia Commons. It’s a black and white photograph of a woman; this is Hannah Mitchell. 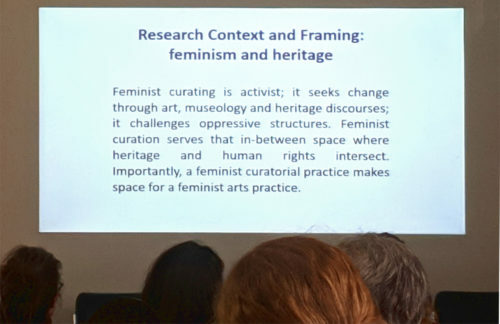 Seventh inset (author’s photograph) shows people looking up a presentation slide, with text reading: “Research Context and Framing: feminism and heritage. Feminist curating is activist; it seeks change through art, museology and heritage discourses; it challenges oppressive structures. Feminist curation serves that in-between space where heritage and human rights intersect. Importantly, a feminist curatorial practice makes space for a feminist art practice.” Text by Dr Jenna C. Ashton. All images covered under Fair Use.